The advanced optical technology of the Fellowes 5 Button USB Optical Mouse provides powerful control and accuracy, allowing ultimate performance. Features built-in MICROBAN® antimicrobial protection that inhibits the uncontrolled growth of damaging microbes, such as bacteria, that can cause product deterioration. This computer mouse will enhance your time at the PC. Did you know that in a recent study, researchers found that the average desk has 400 times more bacteria than the average toilet seat? What is on your desk? 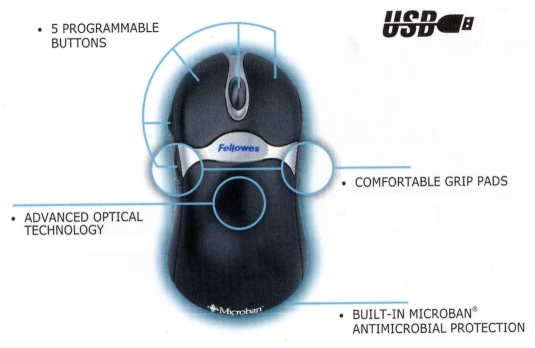 Fellowes has the solution - technology accessories featuring Microban® antimicrobial product protection, Microban® protection fights the uncontrolled growth of damaging microbes, such as bacteria that can cause product deterioration. The continuous Microban® antimicrobial protection is built-in so it won't wash off or wear away, lasting the lifetime of the product. Protect your workspace from damaging microbes - look for Fellowes technology accessories featuring Microban® antimicrobial protection.